Nimbus E prepares for launch. In this historical photo from the U.S. space agency, the Nimbus E, the sixth spacecraft in the Nimbus series, is shown preparing for launch on December 12, 1972 from the Western Test Range (WTR), Space Launch Complex SLC-2, West, by the Thrust- Augmented Delta vehicle. The satellite was placed in an 1100-kilometer run-synchronous nearly circular polar orbit. The spacecraft was designated Nimbus 5 upon confirmation that it had achieved successful orbit. 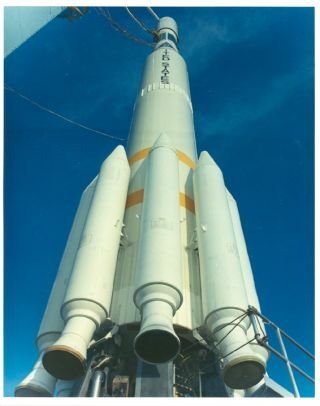 The Delta launch vehicle family started development in 1959. The Delta is composed of parts from the Thor, an intermediate-range ballistic missile, as its first stage, and the Vanguard as its second. The first Delta was launched from Cape Canaveral on May 13, 1960 and was powerful enough to deliver a 100-pound spacecraft into geostationary transfer orbit. Delta has been used to launch civil, commercial, and military satellites into orbit. For more information about Delta, please see Chapter 3 in Roger Launius and Dennis Jenkins' book To Reach the High Frontier published by The University Press of Kentucky in 2002.